I have written 140 (make that 141) blog posts on these pages about Facebook marketing. Everything you need to help you run a successful Facebook Page is right here. Listen to me talk about the Top 16 in more detail on my podcast! But I understand if you stumbled on my website today and don’t want to read 140+ blog posts. I decided it was time to make your life easier by creating a Cliff’s Notes version. 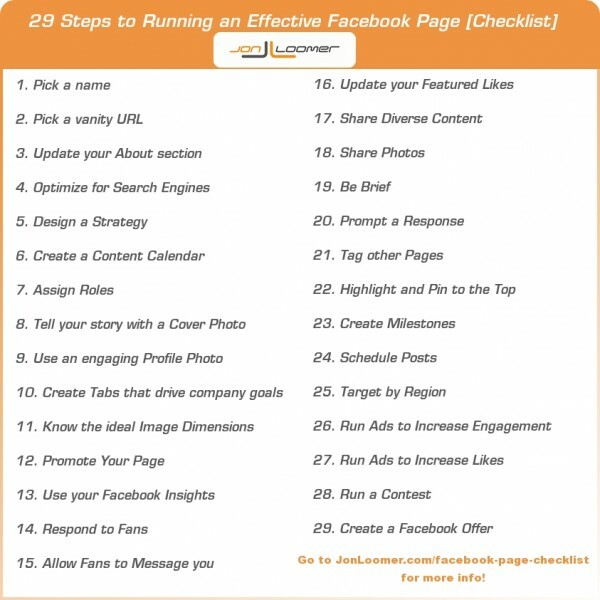 Here’s the ultimate Facebook marketing checklist! Before you write your first post, there are several things you need to do. And if you’ve already written that first post, you should go back and reconsider these things. Picking a name is no trivial matter. Make sure that you pick a name that is consistent with what your customers know you by so that they’ll find you when running a search. But also keep naming conventions in mind. If you have multiple locations or divisions, you’ll want to remain consistent now and in the future. Finally, you’ll need to keep that name within 25 characters (see the link below). Not only is it simply good practice to keep it short, but it’s necessary for advertising. If you want to easily promote your Facebook Page, you need a URL that is easy to put into emails and on fliers. You need a vanity URL. The vanity URL for my Facebook Page is Facebook.com/JonLoomerDigital. Easy, right? To set your own, go to Admin Panel > Edit Page > Update Info. A simple way to drive traffic to your website is to update the About section under your Cover Photo. It is one of the few areas that allows you to hyperlink, and you can use this to your advantage. Describe your company briefly before providing a link to your Page (include “www…”). Everyone knows that to be successful with a website, you need to optimize it for search engines. Yet, it seems no one considers it when building their Facebook Page. Guess what? Your Facebook Page is indexed by Google. You need to load the description with keywords, just as you do your website. Within the same area that you’d update your About section (Admin Panel > Edit Page > Update Info), update the Description, Mission, Awards and Products, filling it with relevant keywords. Google will find you! I know you don’t think that all you need to do is start a Facebook Page and the money will start rolling in… right?? You need a strategy. What is your tone? What are your goals? Who will manage the Page? Do you want to increase brand awareness? Increase sales? Subscriptions? You’ve gotta sort these things out before you get started. And be focused! I know. You don’t want to do this. But it really helps to have structure, particularly in the early going or if you have multiple people managing the Page. Set expectations by creating a schedule. Make a list of your assets and planned content. Then start mapping out themes per day of the week, who will be posting, what they’ll be posting about and at what time. You don’t need to stay strictly to the schedule — it should be fluid and natural — but a starting point helps! If you manage your Page yourself and no one else will touch it, you can feel free to skip this part. But if you have a team or at least one person helping out, you need to consider assigning roles. What you don’t want is a ticked off employee who goes nuts and screws up your page on the way out. You can prevent this. Allow for various levels of control with Facebook Page admin roles. Check the link below for details. I’d like to tell you that the best content wins. It’s just not always the case. Like a website, your Facebook Page could offer amazing content. But if it doesn’t also look awesome, it will be difficult to attract new fans or readers. Before you start, focus on your design. You need to make a great first impression. And if you’ve already started, have no fear. You can fix it! Your Cover Photo is important for first impressions, but your profile photo is what your fans will see every day (or whenever you post). Make sure that you put some thought into this. Should it be a logo? I won’t say, “definitely not,” but faces almost always do better. People want to hear from people, so try to use an engaging image that people want to hear from! Far too many brands neglect this. They create a Page, then wonder why it doesn’t power any of their company goals. Your tabs (the four featured boxes plus the eight hidden below them) are your opportunity to drive your business goals. Create tabs to tell more about your brand, sell product, drive subscriptions or feature a contest. The possibilities are endless. But whatever you can do on your website, you can do within a Facebook tab. Not a designer? Not a big deal. I use ShortStack to build all of my tabs. There’s no reason why you can’t, too! You have a photographer. You’ve commissioned a designer. But everyone comes out looking like garbage. Why? It’s because if you don’t know the ideal dimensions of your cover photo, profile photo, shared photo, highlighted photo or Facebook tab, Facebook will end up resizing your image. And when that happens, good things often won’t happen. Facebook likes to be mysterious about these things. Luckily for you, I take the mystery out of it. See the link below. Alright, so you have a strategy in place. Your Facebook Page looks awesome. So now what? Let’s make it even better! Create signage at your store with a call to action to Like your Page! Brands love to ignore Facebook Insights. Lots of stats, lots of numbers. Math is hard or something. But Facebook Insights are incredibly… insightful! When used properly, you will get a better idea of what types of content your fans respond to and when they’re more likely to engage. If you ignore Insights, you’re spittin’ in the wind. I’m not real sure what that means, but you end up with spit on you. Go to Admin Panel > Edit Page > Manage Permissions and make sure that you have the box checked to show the “Message” button. When this button is available, your fans can privately message you. Think this is a bad idea? Think again. Your fans don’t always want to communicate publicly. Sometimes they may want a personal touch. And in most cases, these people will ones most likely to be a long-term customer. Just make sure you respond! Read This: Are You Missing Your Facebook Page Private Messages? Whether there are multiple Facebook Pages related to your Page or you simply want to provide a resource by highlighting other helpful brands in your space, you can do this. Within the Likes box under your Cover Photo, five of your Page’s Likes will be featured. By default, the Pages that are displayed here will be random. If you want to control the Pages displayed, read the link below! Don’t just share status updates. Don’t just share links. Share a little bit of everything. That doesn’t mean you ignore status updates and links. Certainly share them, too. But also share videos and photos. Share content of others. And use the Questions app for quick questions and feedback. In the end, keep things interesting! There is no type of content that generates better response than photos. Share them! I know what you’re thinking: But I’m not a photographer! I’m not a graphic designer! You’d be amazed at the results you can get with an image that features only text. Or a very simple photo that you took with your phone. When you share photos, it takes up more space than a link thumbnail in a fan’s News Feed. And it’s more eye catching than a status update. Find creative ways to share photos whenever possible to increase engagement! Your fans aren’t on Facebook to read your stuff. I know, it’s crazy. But they’re friends with a few hundred people and Like another 100 or more brands besides you. I’m not telling you this to hurt your feelings. I’m telling you this because brevity is important. Your fans are scanning their News Feeds, looking for interesting information. If you write a book, they’ll ignore it. Be brief. A study by Buddy Media said that the most successful Facebook posts use fewer than 80 characters. That’s not easy. But use it as a goal! What do you think? Like it? Love it? Do it? Should I like it? Don’t expect fans to automatically know they should respond. Actually ask for it. Either end with a question that will encourage a response, or come right out and ask for a Like, comment and share. Such posts are much more likely to result in a desired action! One complaint about Facebook marketing is that you’ll create a post that only 16% of your fans will see and then it is quickly buried on your Timeline. One solution to this is “pinning” content to the top of your Page. You can force any post you’ve created to appear at the top for up to seven days. Additionally, if you have a great image or other post that you want to emphasize, you can “Highlight” it and force it to stretch across the two columns of your Timeline. This is also a good strategy for shaking up the look and feel of your Timeline so that it isn’t a bunch of boring, one column boxes. This is a great opportunity to tell your story. Create Milestones to talk about where your brand has been and how far you’ve come. Attach related photos to those stories. Share when your doors opened, when you made your first dollar, what society was like during the earlier years of your business. Get creative! Scheduling posts goes wonderfully with Facebook Insights. When you use Insights, you may find out that the ideal times to post are not times that you are available. Schedule those posts! Additionally, you may have an international audience. If that’s the case, you are unlikely to be online during certain hours when your other-side-of-the-world audience is sitting at their computers, waiting for your posts. You are missing an opportunity! Schedule those posts! Simply click the clock icon when creating your post to pick the ideal date and time for it to be published. Just don’t lean too heavily on scheduling! Want to schedule a post for people in a completely different time zone but don’t want to annoy people outside of that time zone? Target by country! I actually do this occasionally when I schedule posts. My “main” post will be at about 9:30 am EST. But I realize that a big chunk of my audience is unlikely to ever see that post based on where they live. So I will schedule it for a time in the middle of the night (my time). But I don’t want to hit the same people again who were already likely to see it, so I target only specific countries. You may also have certain content that is only relevant to people in specific countries, states or cities. It doesn’t mean you shouldn’t post it. Just target it! You’re doing everything right. But if you really want to rock the Facebook world, make sure that you do these things! Don’t just sit back and feel bad for yourself when only 16% of your fans see an important post. Understand that due to time online, not much more than that should be expected. Embrace it! Run Promoted Posts. Pay the $5 or $10 to reach more of your fans. Don’t be limited by when they are online. See Promoted Posts as a way to maximize your engaged audience! You’re rocking your Page. Your current fans love you. You even grow naturally because your current fans engage so much that your stories are regularly shared with their friends. But you are impatient. You want to grow faster. You can, with the help of ads! Create ads and sponsored stories that target non-fans. Bring in new fans by focusing on people with specific interests related to your Page or of people who are friends of your current fans. Want to create some buzz and increase fans? Run a contest! A well-run Facebook contest is one that requires engagement to participate. Each time someone engages with your contest, a story is created that their friends see. And keep it so that only current fans can participate! How do I do this? I use ShortStack. Understand that Facebook has strict rules about contests. One important factor is that it must be run through a third party app, and ShortStack has some great templates for creating and managing contests. I may have saved the best for last. If you sell a product, you need to utilize Facebook Offers. It’s an official way of offering deals through Facebook that can become viral in a matter of clicks. Don’t skimp. Create a great offer. Make sure that it’s a desirable product and an excellent deal. Make it irresistible to claim! Suddenly, your fans claim it… their friends claim it… and their friends claim it! When they do this, they see the value in your Page and you’ve naturally increased your audience.